I put a lot (read: way too much) thought into our cards every year, but this year just felt extra special. After all, this is Carmen's first holiday season with us. When I think back to last year, I was still trying to will myself off the couch and scrounge up enough hope to keep believing that the very idea of her was possible. And now, here she is. I've dreamed of sibling photos for a long time, so that was a given. I knew I wanted to order from our favorite greeting card company yet again, Pear Tree Greetings, so that was another given. We get so many compliments on our cards from them every year and the quality makes an impeccable keepsake. But what kind of card did we want to commemorate this extra special holiday season? There were just so many choices! Both my husband and I come from mixed religious families. We have Jewish relatives, we have Catholic relatives and we have friends who are all and none of the above. Something inclusive to everyone is always a must, and in the past this has been difficult -- but never with Pear Tree. There are always plenty of options for those who need to include a whole slew of beliefs in their holiday cheer. Immediately, the real foil cards caught my eye. I mean, real foil with bright, shiny, sparkling goodness -- it was a hard attraction to shake as I continued to browse the website. "I like the blue one with the shiny words, it looks like glitter," piped Ethan from where he sat next to me building Legos. I like his style. We did decide on Be Happy, a fun, minimalist design that added a beautiful pop with your choice of real foil. Blues, silvers, glittery-arctic-sparkling whites -- it was too good to pass up. I decided on a bright blue which complimented our taken-at-sunset photographs beautifully. 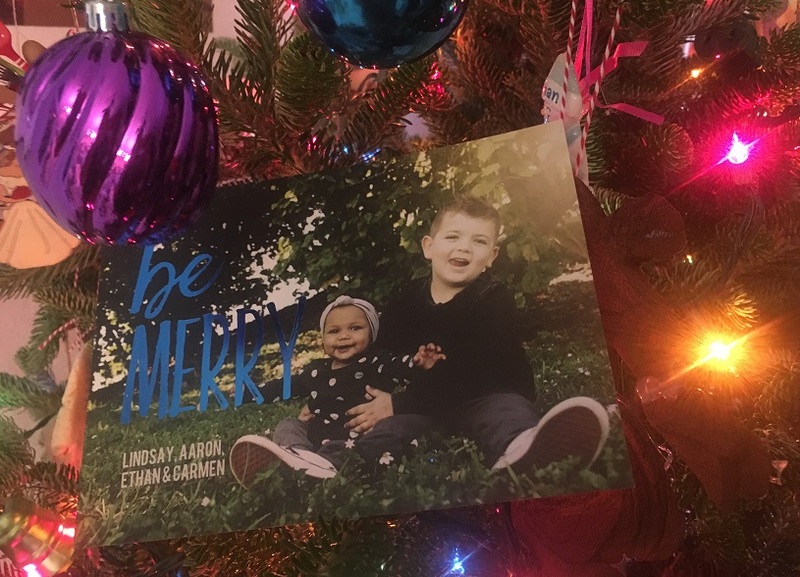 I chose my favorite photo of the two kids for the front and then started customizing the size, font and color for our names. The back of the card also presented many options for customization. Seeing as how I had some more favorite solo shots of each kid, I decided on a collage style print to include them all on the back. For the optional message, I included one of my favorite inspirational quotes from Cory Booker and signed our family's name. Easy, simple, and totally magical. 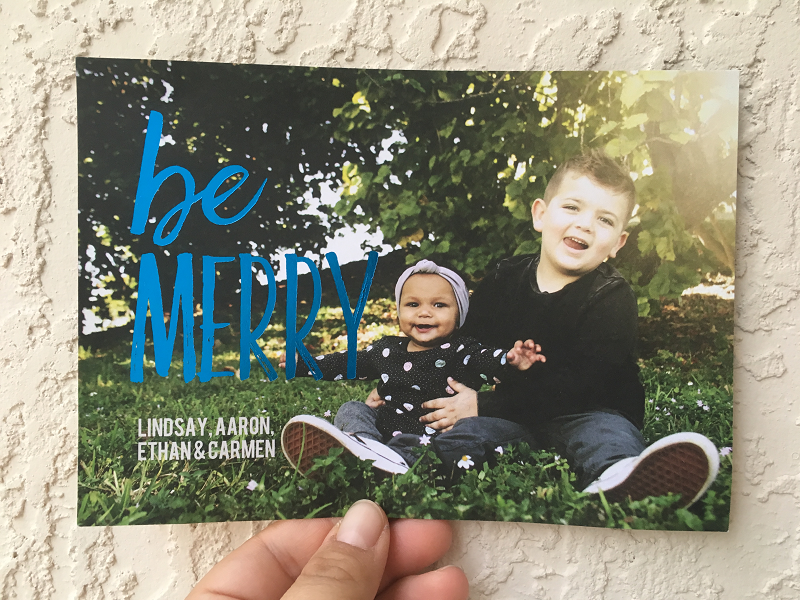 As I begin addressing and popping our cards into the mailbox to reach their destinations (a process delayed by the scrooge of a stomach flu infiltrating our family's house this past weekend -- bah humbug), my heart is just so happy. 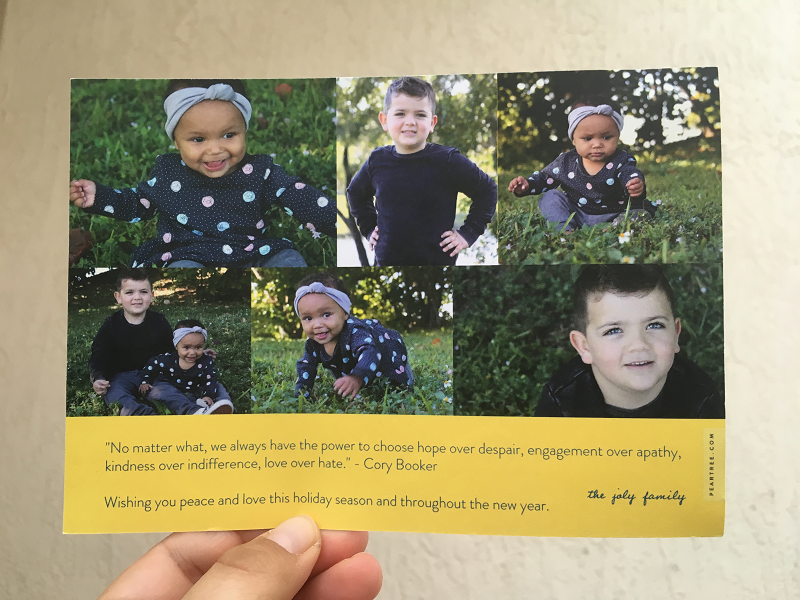 Last year, I didn't think we'd have the opportunity to snap a photograph of our two sort-of cooperative children and include it on a holiday card, but this year we do. This year, I get to proudly send a card with my sunshine and rainbow sort-of smiling (or yelling, but work with me here) on the front to all of our friends and loved ones, and then tuck a copy into the pocket of our family's photo album to remember this year always. 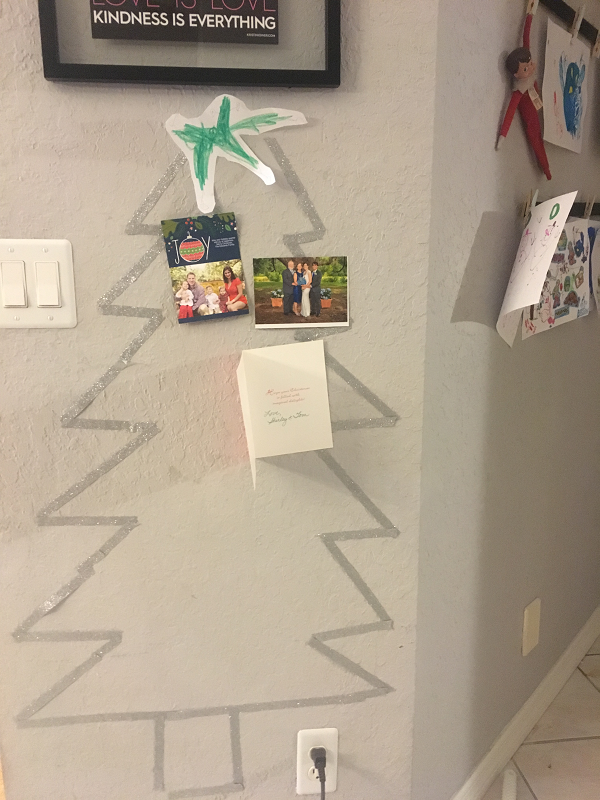 Carmen's first Christmas, documented so beautifully with the perfect pop of blue foil. What's your favorite quality in a holiday card? 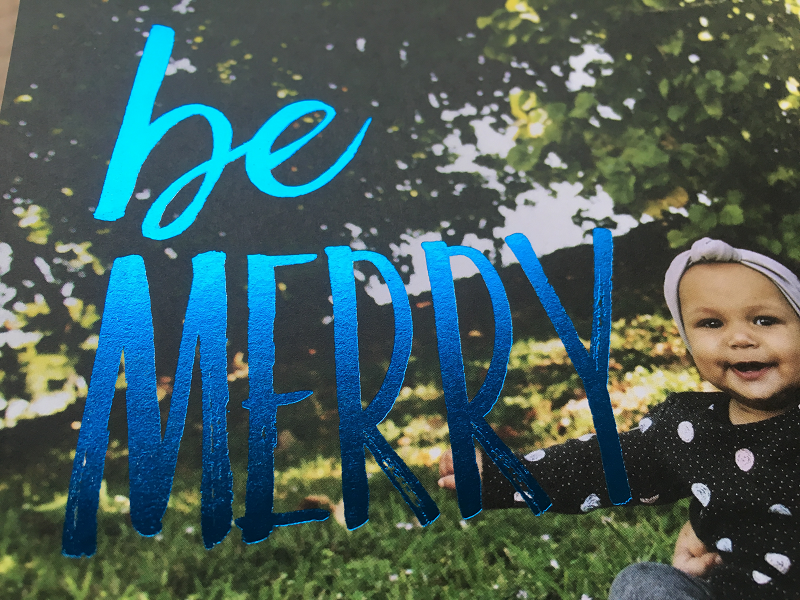 Check out Pear Tree Greetings to build your perfect holiday card!